The Queries panel provides a straightforward interface to search for transactions. You just have to set a date range, an account type, a category and a field name to look for and optionally a particular field. It is fast and easy. Available date ranges are current year, current month, a given year or month or a custom range. You can look into any available type, category and account for any possible field. 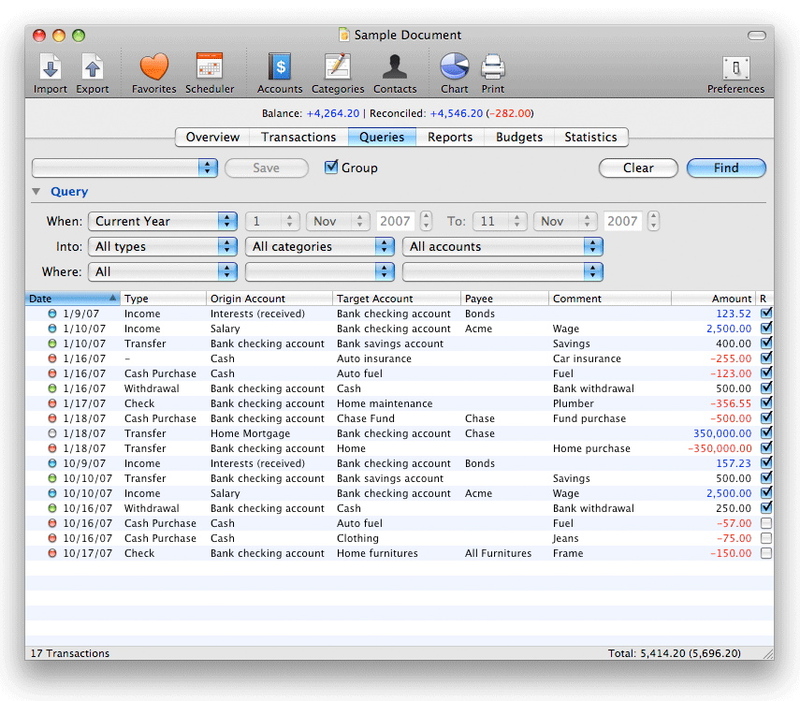 In addition, the Queries panel lets you reconcile your transactions using your Bank statements. You can search for a given Balance or inside a closed range. You can also simply search for unreconciled transactions inside a date range. Press the command key for composite queries (accumulated results between queries). By double-clicking a transaction you will be taken to that transaction exact location in the Transaction panel so you will be able to edit or delete it if required. If you double-click a transaction with the option key pressed you will then be displayed with the transaction details window. The 'Group' check box lets you display grouped transactions as is or un-grouped.